This sweet board book celebrates different types of children that have one important thing in common: they’re all good kids—and every kid is one of a kind. No two kids are alike and this charming story celebrates those special differences that make kids both unique and similar. 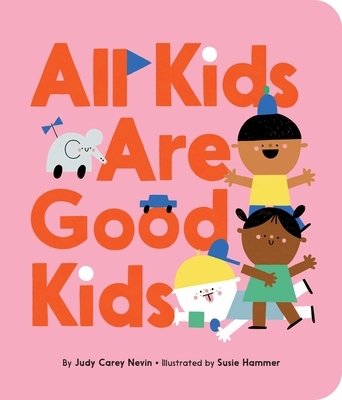 Judy Carey Nevin’s bouncing text paired with Susie Hammer’s brilliant and bright art proves that while children may appear to be different, they also enjoy many of the same things. It’s these shared differences and similarities that make every kid one of a kind. Susie Hammer is a Polish illustrator and graphic designer based in Madrid. Susie uses simple shapes and vivid colors to create a playful, happy imaginary world. She loves drawing and painting and mixing techniques to create something different with each project. Although she works mostly digitally, her hands are frequently stained with all the colors of the rainbow. Susie’s illustrations can be found on textiles, paper goods, and in magazines and books throughout Europe. When she is not daydreaming about dogs driving cars, Susie can be found teaching art workshops for children.